There’s something that rum and vodka have in common, and that is they’re almost always consumed in a mixed drink. With vodka, it’s plain to understand—there isn’t much to it. Certainly there are vodkas of higher quality, but we’re talking about something that tastes exactly like rubbing alcohol versus something that tastes less like rubbing alcohol. Rum is odd then, since it has a distinctive flavor. Cheaper rums tend towards acetate or overpowering vanillin. But a decent aged rum has its caramel and vanilla esters atop the magical transformation of sugar cane into distilled manna. It can be almost singularly drinkable! Good aged spiced rums can be sipped, but there, the spices bring their own characteristics. A fine sipping rum is a rare breed. 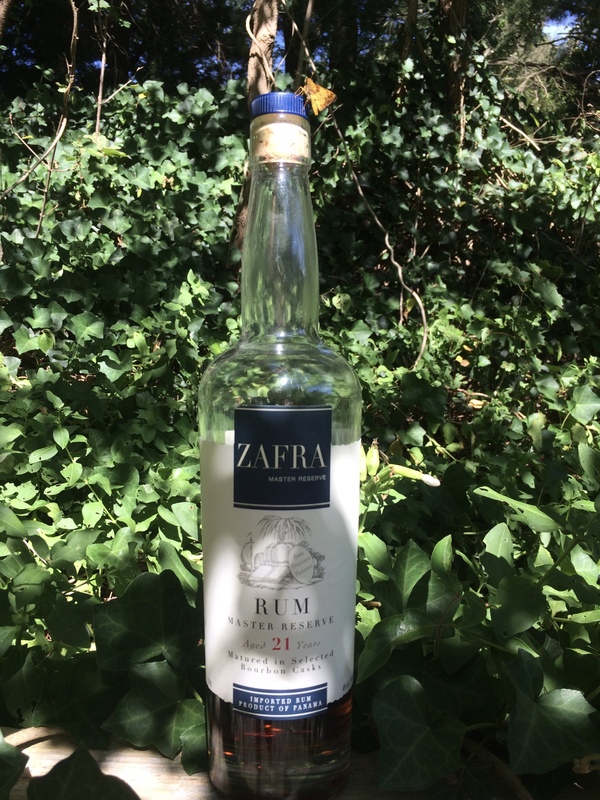 A few weeks back, the interesting bottle-shopping site, Flaviar, offered Zafra Master Reserve, a rum aged for 21 years and matured in bourbon casks. One of the interesting aspects of Flaviar is that bottles come and go; there is no long-term stock, so if an eye-catching bottle is offered, the temptation to buy it ratchets up, as it has a limited lifespan on the site. The incentive to buy increased, since the bottle of Zafra apparently retails for over $90, but Flaviar was offering it for $45. I’m of the opinion that a 21-year old bottle of anything is worth at least $90, so it was very, very difficult to resist the purchase. I swear it was the moth that drank all that! I will save everyone the exposition for a moment—you’re all dying to know, I’m sure!—but my biggest regret with this purchase is that I did not buy multiple bottles. This is an astoundingly great bottle of booze. One can choose to ignore that it is just rum. It is smooth and flavorful and rich, at least as good as any fine whiskey or añejo tequila I’ve ever had. In the interest of science, I made a variation of a Dark and stormy cocktail out it. It was perfectly delicious, but also an incredible waste of two ounces of the finest rum. I’ll now drink it exclusively in a lowball glass with a drop of water, which makes it the fourth liquid I enjoy at room temperature, the others being water, Samuel Adams Utopias, and Michter’s straight rye. The $90 retail price does not seem like it’s held fast by many merchants. A search on the ol’ Googs gives a price around that $45 mark, so it might be possible to get more bottles for this insanely reasonable price. Zafra Master Reserve is a product of Panama and is 80 proof. My review bottle was bottled in 2016.